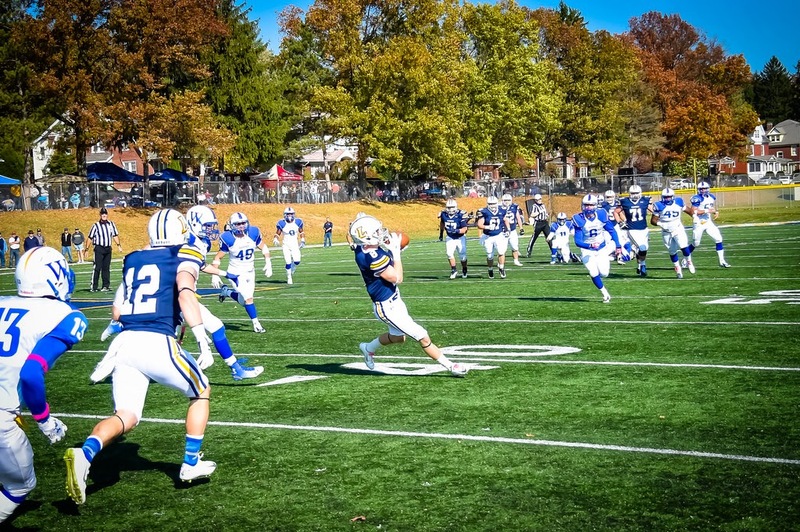 WILLIAMSPORT, Pa. – With only the third 200-yard receiving game in program history, the Lycoming College football team’s junior Ryan Umpleby (Forest Hill, Md./Fallston) has earned a spot on the Middle Atlantic Conference Weekly Honor Roll, the conference office in Annville, Pa., announced on Sunday, Oct. 26. Umpleby had a standout performance with 14 catches for 203 yards to lead Lycoming against 13th-ranked Widener. Umpleby's performance was one of the best in Lycoming's history, as his 14 catches and 203 yards are both the third-best marks in program history. He is the first Warrior to catch more than 10 passes in a game since Ryan Wagaman had 15 at Wilkes on Oct. 30, 2010 and the first to post a 200-yard receiving game since Warren Oliver posted a record 215 at Westminster on Sept. 10, 2011. A dynamic receiver, Umpleby is third in the MAC in receiving yards, posting 667 and six touchdowns on 45 catches through the first seven games. He is also third in the league with 45 receptions and his average of 114.4 all-purpose yards per game is eighth in the conference. The Warriors get back on the field on Saturday, Nov. 1, when they head to Misericordia for a 1 p.m. MAC clash.